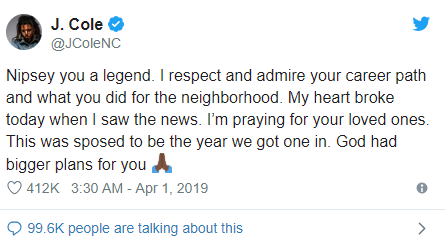 The 33-year-old, who was gunned down outside his clothing shop in Los Angeles was described as "a man of respect and a don" by Drake. Rihanna wrote on Twitter: "This doesn't make any sense! My spirit is shaken by this!" Two other people were injured in the shooting outside Marathon Clothing in south Los Angeles. 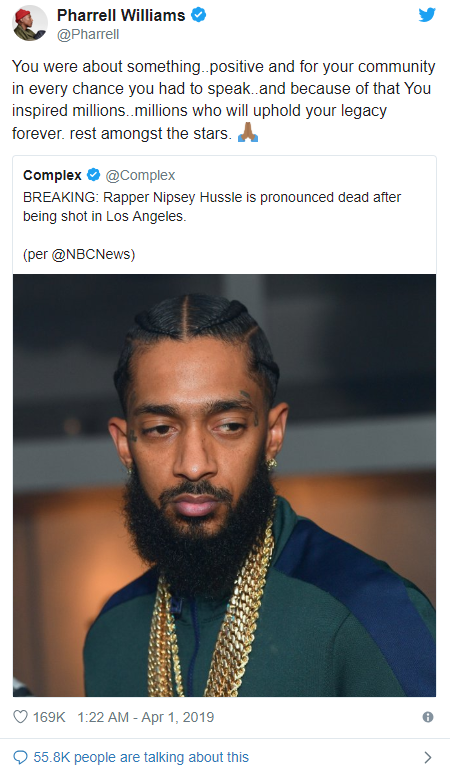 Writing on Instagram, Pusha called him a "rare breed" adding: "Sad to see you go Nip, I'm only finding peace in knowing you are blessed... I was honored to share in such an amazing year with you musically. "My whole energy is just at a low right now hearing this," he wrote. "We just linked for the first time in years and said we were gonna do a new song this summer cause it had been too long. " Other to pay tribute included rapper J. Cole and maker and artist Pharrell Williams. Do you give your respects?